Spring is near and that means more flowers and… more flying and creepy crawlers. One in particular that we want to focus on staying away from is the the gypsy moth. The federal government has joined with the moving and storage industry to urge those planning to move to help stop the spread of this invasive insect that threatens our nation’s landscape. The European gypsy moth has dramatically changed the countryside of 20 states and Washington, D.C., since it was introduced in the late 1860s. Without the public’s help, it threatens many more states. 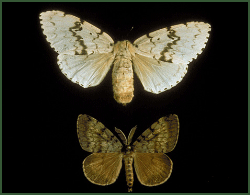 Since 1970, more than 93 million acres in the United States have been defoliated by the gypsy moth. An infestation of gypsy moth can defoliate up to 13 million acres of trees in one season if left untreated. A few simple tips from the experts: Inspect outdoor household goods — lawn furniture, grills, outdoor toys, camping equipment, etc. — for gypsy moth egg masses. Female moths lay their eggs and the caterpillars spread during the spring and summer months. The removal of the egg masses from their locations can be performed easily with a putty knife, stiff brush or similar hand tool. Simply dispose of the egg masses in a container of hot, soapy water, or place them in a plastic bag, seal it, and set it in the sun. The U.S. Department of Agriculture requires anyone moving from an area infested with the gypsy moth to a non-infested area to provide an official certificate of inspection of all common outdoor household articles that could carry the gypsy moth. To meet this requirement, one can perform a self-inspection of household goods or hire a state-certified pesticide applicator. The driver of the moving van is required to have the inspection certificate on hand for the entire journey.